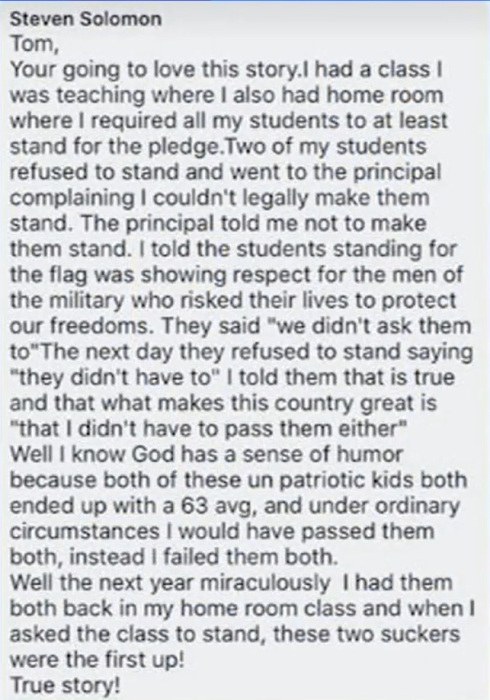 Long Island health teacher Steven Solomon has been suspended from student work after posting on Facebook that he had failed two students in the past for failing to stand for the Pledge of Allegiance. The Uniondale School District is aware of a teacher posting on social media about a situation involving grades and standing for the Pledge of Allegiance that occurred more than a decade ago. The District has taken the proactive measure of assigning this faculty member to out-of-classroom duties until further investigation into the matter can be completed. The District will make available any information that is uncovered that can legally and responsibly be released to the public. The incident Solomon references in the post took place ten years ago at Uniondale High School, according to the Merrick Patch. Once alerted to the post, Uniondale High School parents objected to passing or failing students on the criteria of being suitably “patriotic.” Others objected to Solomon’s use of “suckers” for the affected students, who have not been identified at this time. “These students failed themselves. They had less than a passing grade, and that combined with poor behavior, which included, part of it was they didn’t stand for the pledge,” Solomon added. “I thought this just went to [his Facebook friend],” said Solomon, who says the post he was responding to claimed that “teachers don’t teach respect anymore” and “don’t have kids stand for the pledge anymore” and he wanted to set the record straight.